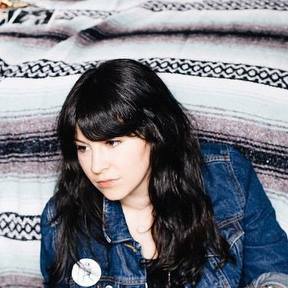 It started out like any other Saturday: getting up early and going to the flea market to hunt for records and avocados from the produce venders. 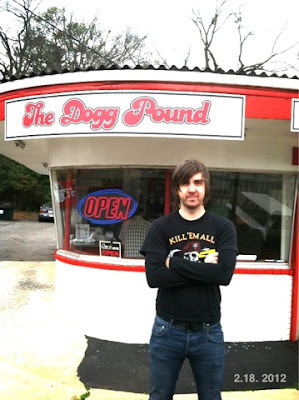 On the way back, I brought up wanting to try The Dogg Pound, a new-ish specialty hot dog joint in a location I always forget about (out Broad St. in the diner-looking building that use to be a BBQ place.) 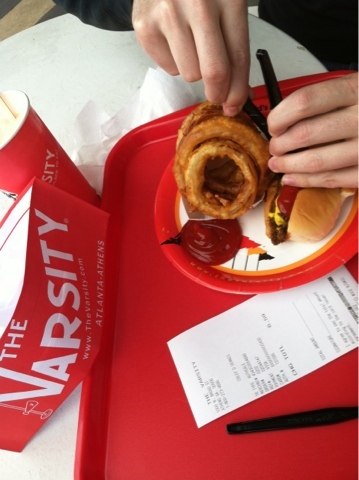 Coley added that speaking of hot dogs, in his 10+ years in Athens, he'd never been to The Varsity- not even the Atlanta location! We joked about going to both places back to back, and how funny that would be, and seconds later decided it was a genius plan. 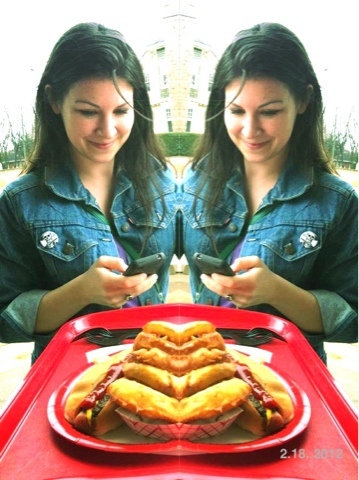 We would set out to compare the subtleties of our two local hot dog purveyors, then food comas be damned, go to work at our evening jobs. 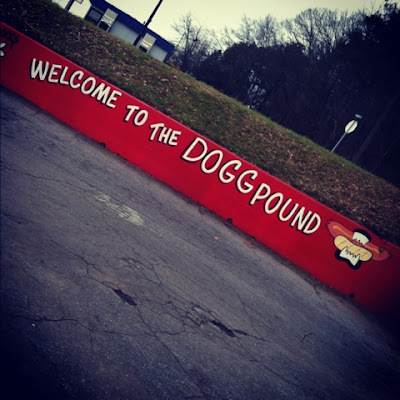 First stop was The Dogg Pound. I think you are supposed to read this mural to the tune of "Welcome To The Jungle." When we walked in, two gentlemen were sitting at the corner and had already ordered. The menu had some enticing options, and it took us a few minutes to weigh the benefits of The Beverly Hills Chihuahua, The Chow Chow Dogg, The Boston Terrier, and The Philly Dogg, among others... and then another ten to fifteen minutes for the employee at the counter to take our order... and another ten to fifteen minutes to get our drinks... Everyone was certainly pleasant, it just seemed to take an awfully long time for sodas and hotdogs with only four customers in the restaurant. I felt bad for the drive-through customers who didn't realize the wait they were in for. Since The Dogg Pound also advertised deep fried treats, I was hoping to find some fried pickles or onion rings, in addition to the funnel cakes and fried twinkies. 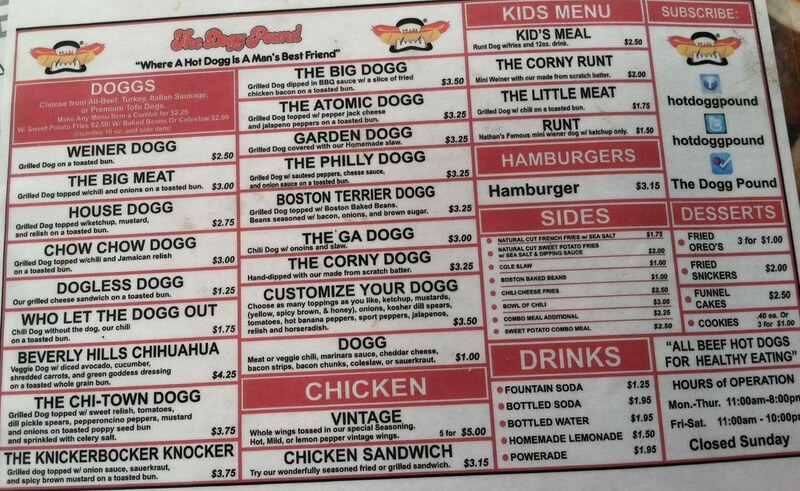 One pro of The Dogg Pound is that any item can be served as a beef hot dog, chicken dog, or tofu dog. 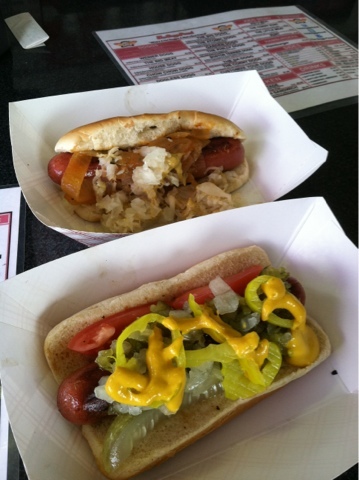 We settled on The Knickerbocker Knocker ("grilled dog topped w/ onion sauce, sauerkraut, and spicy brown mustard on a toasted bun") and The Chi-Town Dogg ("grilled dog topped w/ sweet relish, tomatoes, dill pickle spears, peperoncini peppers, mustard and onions on toasted poppy seed bun and sprinkled with celery salt.") The Kickerbocker Knocker was tasty, though the onion sauce was less of a sauce and more stewed onions. 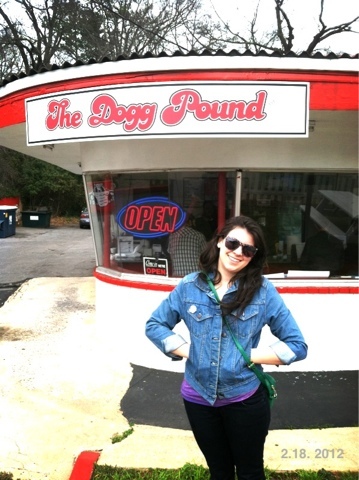 The Chi-Town Dogg was a bit disappointing. It wasn't on the bun listed, and there was no celery salt. I've only been to Chicago a handful of times, so I'm no expert, but I was under the impression that the two things that make a Chicago dog Chicago-style are sport peppers and celery salt. I'm a fan of banana pepper rings (that's what these seemed like,) but they aren't the same as sport peppers. Next stop: The Varsity. The Varsity was packed when we got inside, but their signature style is to move customers quickly, with ample employees at registers barking "What'll ya have? What'll ya have?" We ordered and received our chili dog, onion rings, and frosted orange (think frozen creamsicle drink) to split within five minutes. I realize it's a bit unfair to compare a new independent restaurant to an established string of restaurants, and both places have their merits, but The Varsity emerged as the winner that day. 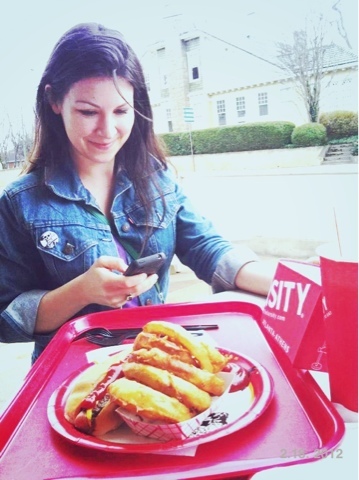 If you asked me to name a messy food, a chili dog is the first thing that would come to mind. Seems like Varsity found a way to drain their chili or cook off the excess water, making it surprisingly not messy, even when shared. Served standard with mustard, we added some ketchup for good measure. The onion rings are handmade, which taste great compared to the standard frozen kind you can get anywhere (watch out for the onion ring grease pool, though.) The frosted orange drink sealed the deal for Coley. It's a little less creamy and more icy than a milkshake, making it a bit less filling. Bonus: free hat. Splitting this stuff was the way to go. I felt surprisingly not terrible afterward. Maybe I'm just growing too used to this kind of eating? Food comas soon subsided, and we made it into our respective evening jobs.